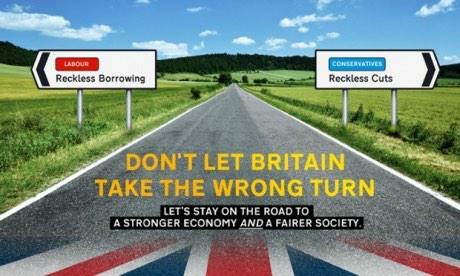 The Liberal Democrats have released a poster which borrows from the Conservative poster ‘road to recovery’ (a.k.a ‘highway to hell’) from earlier in the year. The strategy is sound enough; it accuses Labour of being profligate with public money and the Conservative Party of being ruthlessly obsessed with cuts. The creative execution is, however, very lazy indeed. Creating a ‘piss-take’ poster 3 weeks after the original came-out is completely pointless. It’s either got to be within hours of the original or not at all. And even then, it has to be very funny indeed. This is neither timely, nor amusing. Must do better.